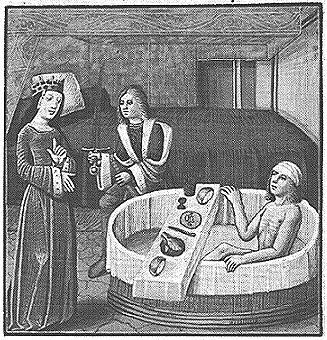 Bath and board; Tristan, Paris, 1494-95. Soap was probably invented in the Orient and brought to the West early in the Middle Ages. This was a soft soap without much detergent power. Generally it was made in the manorial workshops, of accumulated mutton fat, wood ash or potash, and natural soda. Laundresses might also use a solution of lye and fuller's earth or white clay. They worked usually by streamside, rhythmically beating the material with wooden paddles. After the winter's freeze they had a great spring washing of the accumulations. It was on such an occasion in the Merry Wives of Windsor that Falstaff hid in the laundry basket. Hard soaps appeared in the 12th century. They were luxury articles, made of olive oil, soda, and a little lime, often with aromatic herbs. They were manufactured in the olive-growing south, especially Spain; hence the modern Castile soap. Shaving was difficult, painful, and infrequent, since the soap was inefficient and razors, which looked like carving knives and perhaps substituted for them at need, were likely to be old and dull. Even haircutting was disagreeable. Scissors were of the one-piece squeeze type, similar to grass trimming shears; they must have pulled mightily. Although by the thirteenth century a few aristocrats had tooth brushes, the toilet of the teeth was generally accomplished by rubbing with a green hazel twig and wiping with a woolen cloth. Excerpts from: The Middle Ages by Morris Bishop. New York: American Heritage Press, 1970. "When he took a bath, he hardly ever used any soap or preparations to make his skin shiny, which is even more surprising, since he was familar with such cleansing methods and royal comforts from early childhood." Excerpts from: Leben im Mittelalter by Hans-Werner Goetz (Albert Wimmer, translator). Notre Dame: University of Notre Dame Press, 1993. Gilbertus Anglicus, born about 1180, was the author of the Compendium Medicinae (1240), one of the leading medical works of the early Middle Ages. In addition to a variety of medicinal advice and instructions, the Compendium also concerns itself with hygiene and the care of one's appearance. Steam baths to soften the skin and open the pores, and washing in warm water, carefully drying the skin, are suggested. Pale cheeks may be improved with a lotion of "Brazil-wood chips" soaked in rose water, or conversely, if the face is too red, the root of cyclamen will blanch the skin. Freckles, moles, wrinkles, warts and other skin blemishes are all discussed as well as halitosis and bodily odors which strongly imply that the seeking of artificial beauty aids is no new phenomenon. Excerpts from: Medieval English Medicine by Stanley Rubin. New York: Barnes and Noble Books, 1974.